When you bring home your baby, it can feel pretty daunting trying to keep track of all the things you need to handle so they can be happy and healthy as they grow up. Nutrition, sleeping, and avoiding illness are just a few on a long list of important tasks to be managed. To ensure your baby is growing up healthy, it is vital you have regular well-baby visits with your pediatrician throughout their first year. 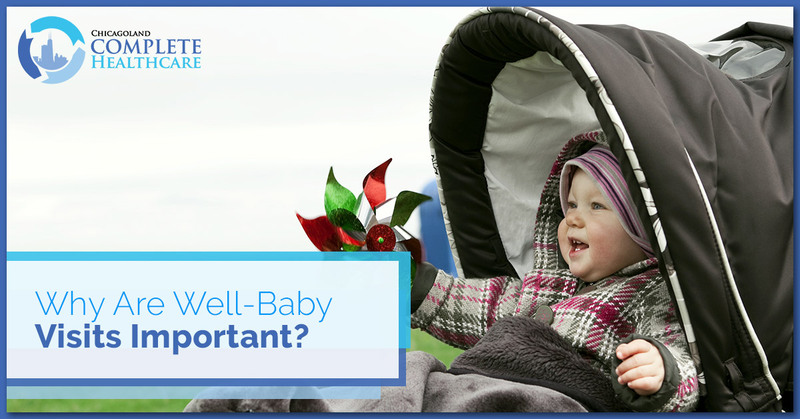 Today, we’re going to take a look at what you can expect from well-baby visits and why they are important. If you’re in the Chicagoland area and you’re looking for newborn care for your little one, call Chicagoland Complete Healthcare. -How Often Should Well-Baby Visits Happen? Your first well-baby exam should take place within 24 to 48 hours after you’ve left the hospital with your newborn. After that initial exam, the next one will typically take place about two weeks later. Following that, exams will be held as they reach 1, 2, 4, 6, 9, and 12 months of age. Through these exams, a variety of things will be tracked to monitor your baby’s development. At each exam, the pediatrician will measure your baby’s length, weight, and circumference of their head. Because the first year is such an important time for a child’s development, it is vital to make sure everything is on track and growing as it should. This will be an opportunity for the doctor to ensure the fontanels (soft spots of the baby’s head) are closing as they should. Additionally, your baby’s eyes, ears, and mouth will be checked, and the heart and lungs will be listened to, verifying their condition. As they continue the examination, the pediatrician will check for any signs of rash or jaundice. While exams should not be dreaded, they are incredibly important to discovering health problems such as hernias or heart murmurs, which would require working with a specialist. No matter what the problem is, early detection makes treatment possible to avoid worse issues through childhood. For instance, if a baby has congenital hip dysplasia, where their hip is undeveloped in the socket, it can be corrected with early detection. That ensures your baby will be able to walk comfortably as they get older. Your doctor will be checking for developmental markers at every visit, including your baby’s ability to make and maintain eye contact, smile, and sit up without needing support. While these markers aren’t necessarily physical, they will help track your child’s development mentally, emotionally, along with their sense of balance. To ensure the health of your newborn, there are some recommended vaccinations they will need to receive. They will get their first of these vaccinations, the hepatitis B vaccine, before they are released from the hospital. Following that, vaccines intended to prevent whooping cough, mumps, measles, and other childhood diseases will be administered at well-baby visits. Do they have a specific call-in period when you can reach them? What hospital is the doctor affiliated with? What to do with an after-hours issue (emergency and non-emergency)? What to do if the doctor is not available? Raising a child is a beautiful and fulfilling part of anyone’s life. To ensure your baby grows up healthy and happy, you need to make the most out of your well-baby visits with your pediatrician. Tracking their growth and development, checking for any issues for early detection, and administering the proper vaccinations will keep your baby in good health as they begin their journey through this crazy world of ours. If you are in the Chicagoland area and you are in need of Newborn Care, please call Chicagoland Complete Healthcare. Our experienced, friendly, and knowledgeable team will be more than happy to answer any questions you may have about how we can help you. We hope to hear from you soon.